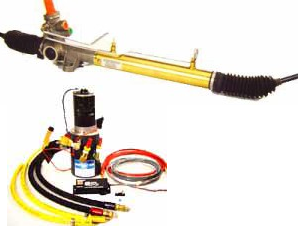 Drive-Master carries a full line of custom steering systems, columns, and extensions. Our columns can accommodate any driver’s need. The Drive-Master extended steering column brings the steering wheel with air bag closer to the client. Usually used in conjunction with a wheelchair driver. O.E.M. functions such as ignition shift lever and turn signal stick remain at the same distance as the O.E.M. Drive-Master has the capability of manufacturing custom steering column systems for all types of situations. Shown here is a horizontal under construction in a Chevy Tahoe. This is used for persons who can ambulate but have a limited range of motion or other special challenges. For those customers without arms or the use of them, the foot steering system is usually combined with sensitized steering and adaptations for other dash controls. Drive-Master understands that most items concerning foot controlled steering need to be customized according to individual needs. Shown left is a Drive-Master customer’s loafer attached with steering pin to the foot steering wheel. Other customers have requested everything from non-slip pads to roller skate shoes! Ask our professional staff for help deciding what would be the best means to steer your vehicle with your feet. Drive-Master can install your custom foot steering system. Call us today and speak with one of our salespeople. In a short time Drive-Master will install your custom foot steering system. We recommend mid- to full-sized American cars and some minivans for this modification. The Drive-Master horizontal steering system is customized to meet the needs of those with high-level spinal cord injuries and all others who experience limited arm strength and range of motion. It is usually used in conjunction with AVEITL hand controls. For positive one-hand control of the steering wheel. Remains in a fixed position via two support straps stemming from a fixed base which is attached to the steering wheel. The base’s position along the inside of the steering wheel is adjustable according to the individual’s abilities. Steering device for drivers with minimum grip; stabilizes the driving hand securely. Secured base is also adjustable according to individual abilities. Can be placed at any position on the wheel according to driving prescription and personal comfort. Comes with soft insert. Requires moderate tensor control. Accommodates most drivers with a prosthetic hook on their steering arms. Made of durable steel and can be placed most locations on the wheel. The prosthesis should have soft surface pinchers. Single pin steering device for the driver with full use of steering hand and arm. Pin is covered with foam to provide the driver with maximum comfort. All Steering Modifications require an Evaluation by a State C.D.R.S. Certified Driver Rehabilitation Specialist or you must already have a Restriction on your Driver’s License for Mobility Equipment before we can install any Driving Modifications or Controls in your vehicle. For more information on a CDRS contact your Mobility Consultant at Drive-Master or visit www.aded.net.